aviation – Brett Malden aka "bmw"
FRANK. Awarded Full Service AOR for ACP Jets. Miami-based advertising agency, FRANK., was selected as the Agency of Record by ACP Jets for a multi-tiered marketing campaign, including re-branding, strategy, advertising, interactive, media and public relations. First order of business- a new corporate identity and brand message. Injet – Go Fly. 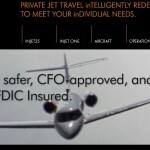 PRIVATE JET TRAVEL inTELLIGENTLY REDEFINED TO MEET YOUR inDIVIDUAL NEEDS.